I hope that you have been practicing the simple breath meditation I spoke of in last month’s column. This month, I would like to continue talking about conscious breathing, also called Pranayama. The inhale, what you bring in, is called prana; the exhale, or what you put out, is called apana. I’m sure it sounds strange to say that I want to teach you how to breathe. 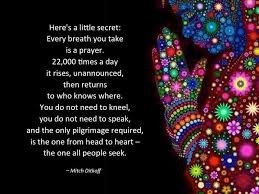 We all breathe everyday, constantly, all day. It’s what we do. But, we are not consciously breathing. Think about how you breath in different situations – when you are exercising, when you are thinking over a problem, when you are at work, when you are angry, sad, upset. On each of these occasions, your breath comes differently, and, most likely, without any conscious thought at all. The world has become a crazy place and the pace we are expected to keep goes beyond any reasonable sense of normalcy. People are rushing from the minute they get up to the minute they lie down to sleep. We are not acting – we are reacting to any number of things simultaneously. Look around. Everyone has a phone in their hand, afraid they are going to miss something. In my own opinion, this is a world gone wrong. We should be slowing down, trying to appreciate each other, in person not on a device; walk in the beautiful world, enjoy what is out there and what we each have. In addition, we have already entered the craziest part of the year – holiday after holiday after holiday. As if the world wasn’t rushed enough, it now goes into overdrive. Believe me, I know from first hand experience that conscious breathing will help get you through it. The breath is a fundamental tool in being able to control your emotions and your mood. It can give you clarity of thought; increase focus; increase your patience (and who doesn’t need that? ); reduce and prevent toxins in your body that we are continuously bringing in via food, drink and air. It does this while also expanding your lung capacity; cleansing your blood and relaxing and calming you. Just a slight change in the breath creates a huge impact. Amazing, yes? With that being said, I am going to describe a few different breathing techniques. As you do each other, please be aware of how each one makes you feel. Do you notice any change? Physically? Emotionally? Mentally? For Calmness – Inhale for a count of 4 and exhale for a count of 8. This is a good breath to practice when you are feeling stressed or anxious. Produces a clam and relaxed state of being. Sitali Pranayam – Open your mouth in a circle, curl your tongue and inhale through the mouth, through the tongue and exhale through the nose. This is a calming breath. It is also a cooling breath, lovely to do in the summer or when you have a fever. 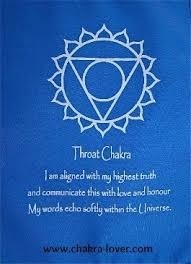 I have taught this breath to several sick children through the years to help with their high temps. For Relaxation – Breathe only through your left nostril. The left side of your body relates to the moon, which is the calming and receptive side of your body. Abdominal Breathing – For this one, you should be lying down on your back. Place your hands on your abdomen, below the navel. Begin the long deep breathing from the last column. On the inhale, the breath should push the abdomen gently against your hands and on the exhale, the abdomen gently goes down, as do the hands. 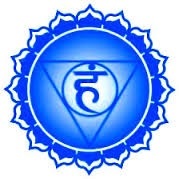 This helps to open up your 3rd chakra (energy center), works on digestion, eating problems, enhances your creative energy and will help you to feel both relaxed and energized. I hope that you will try some or all of these breaths of the next month. As always, if you have any questions, or are looking for a breath meditation for a particular problem, please feel free to email me at ShaktiWarriorSpirit@gmail.com.